The various bridges (Kadal) under which we passed, the boatmen shouting together in chorus as they worked their hardest to keep the boat steadily in the middle of the stream, were all pf the same type; their foundation are of deaodar piles, then logs of wood about twenty-five to thirty feet long and two or three feet in girth are led two feet apart at right angles, alternately with layers of stone. So piers are built up from about twenty-five to thirty feet in height, and twenty-five feet square. These stand ninety feet apart, and are spanned by long, undressed deodar timbers. The force of the stream is broken by abutments of stones running to a point constructed on the up-stream side. These answer admirably their purpose, stemming the wild rush of waters and standing securely for hundreds of years, even when exceptional floods, like the terrible one of July, '93, have swept all away. Even on that occasion the first bridge the Amiran Kadal though submerged, stood, but all the others were swept away. 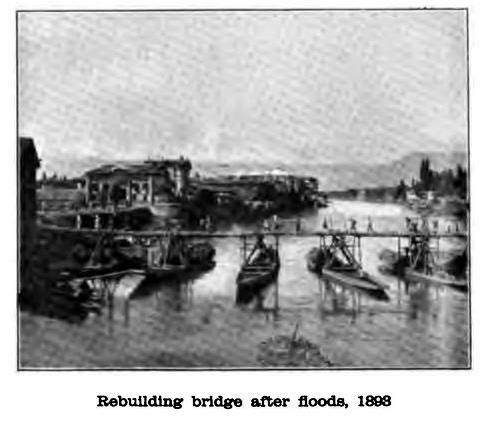 This was one of the worst floods ever known in Kashmir, and terrible destruction to city property resulted from it, more than two thousand houses disappearing in it. Mercifully, comparatively few lives were lost, though, of course, the amount of discomfort and misery it caused was very great. 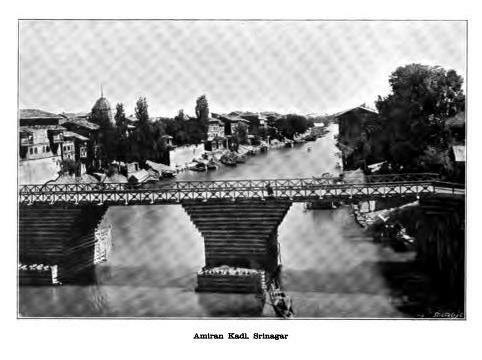 - from the book ‘Afoot Through the Kashmir Valleys’ (1901) by Marion Doughty. Finally found out the exact details of how those magnificent bridges were built in old times and a photograph of the build under process.